that is jammed packed with laughs, magic, and surprises for our 2019 season! Every weekend, our various entertainers will be performing live, interactive shows that all park guests can partake in! everyone in the family is bound to have fun! Come on out to Victorian Gardens to join the good time! To see who is performing when, check out the upcoming Entertainment Schedule ». Arnie Kolodner has performed professionally in New York since 1983 after earning his BFA in Drama from NYU. 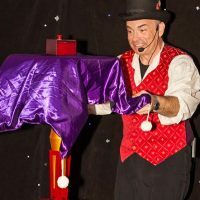 From birthday parties, school functions and libraries to corporate family events, Arnie has established himself as a unique magician by presenting interactive performances that seamlessly weave amazing magic illusions into classic tales. Arnie was named Best Children’s Magician by New York Magazine and has been featured in W Magazine, Town and Country Magazine, The New York Times, on NY1 TV, and The Late Show. Arnie has also been a featured lecturer at Kidabra, the international convention of professional children’s magicians. Ellie is a professional circus entertainer, originally from Milwaukee, Wisconsin. 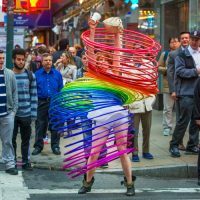 Her work has been featured internationally on stage, in television/commercials, in fashion, and in the center of circus rings across the country. She graduated from the University of Cincinnati, College-Conservatory of Music and currently resides with her husband and three tuxedo-kitties in Park Slope, Brooklyn. 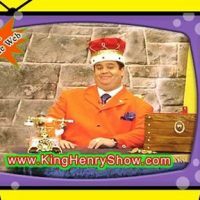 As seen on his own TV show, King Henry is one of New York City’s funniest and most requested children’s magicians. During every show, King Henry asks for volunteers to help him perform various magic tricks. With his dapper attire and quick witted magic tricks, he keeps children and their parents laughing from start to finish. Watch out when he sneezes, because something magical is bound to happen. 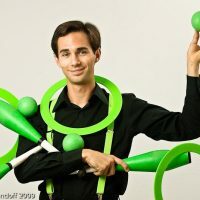 Michael is an international award-winning juggler who has toured the world for the past ten years with his incredible performances. 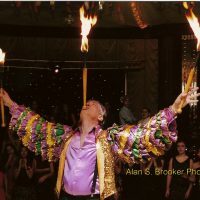 He is not only dedicated to providing high quality entertainment – he is excited to work with you, customizing his acts to help get your message across. If you’re looking for a high energy performer who can both wow your audience and make them feel like they’re part of the act, book Michael Karas today. Come see why Sammie and Tudie are New York’s favorite Comedy Duo! 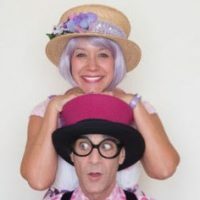 With their signature brand of silliness, Sammie and Tudie will take both kids and parents on a wild ride of fun, magic, and zany props. Come see what everyone is talking about! Created for all members of the family. Stop by after each show to say hello!